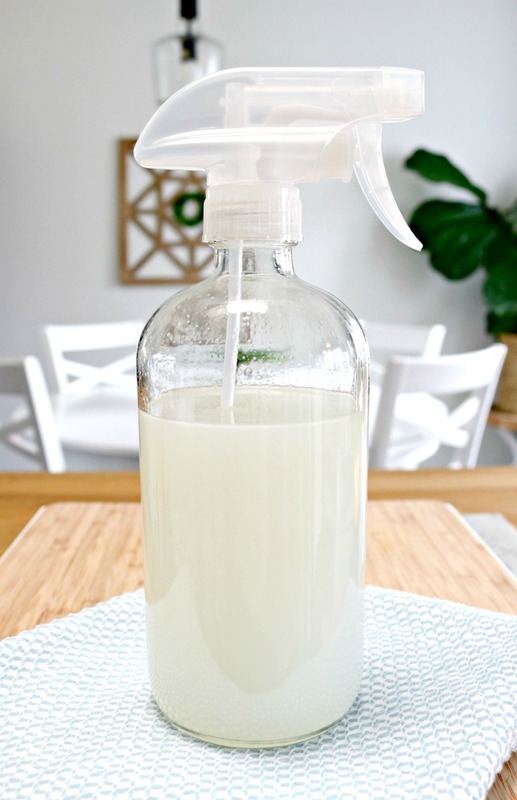 It’s easy to make your own DIY 3 Ingredient All-Purpose Cleaning Spray. 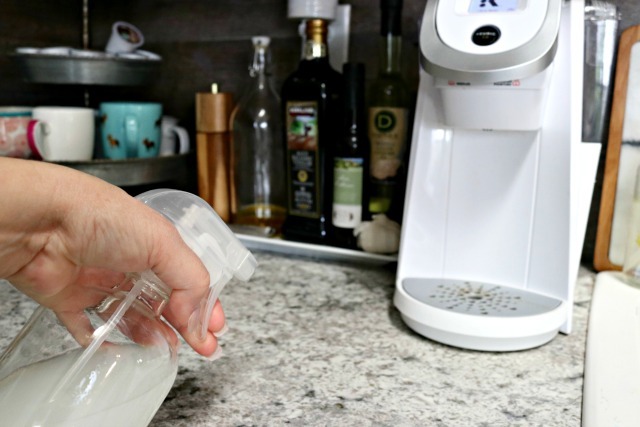 This easy cleaning solution will help disinfect your kitchen counters, appliances and tables too! 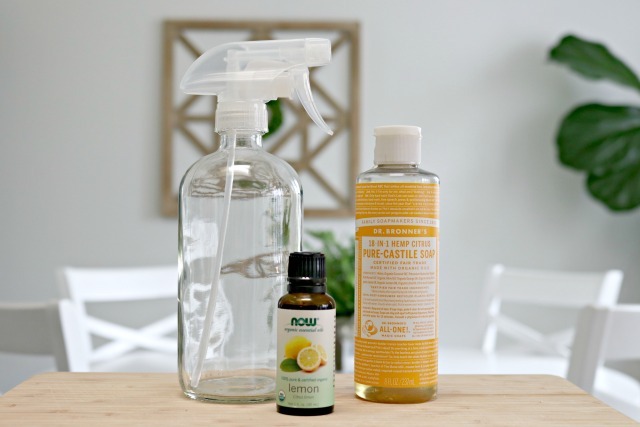 Store bought all-purpose cleaning sprays can be super harsh and full of chemicals and toxic ingredients. 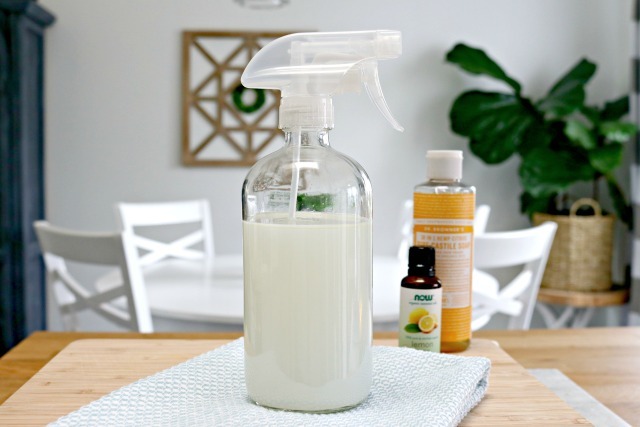 This DIY cleaning spray only requires 3 natural ingredients and is great for cleaning almost everything in your kitchen. 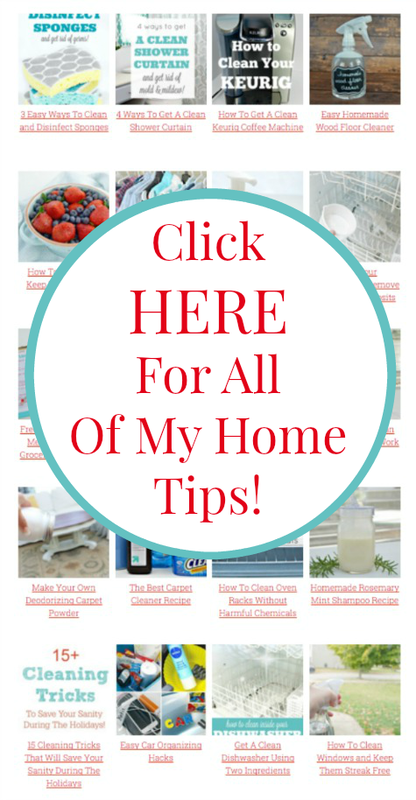 This post contains affiliate links to products that I use and recommend. If you click on any of these links and make a purchase, I will receive a small commission. 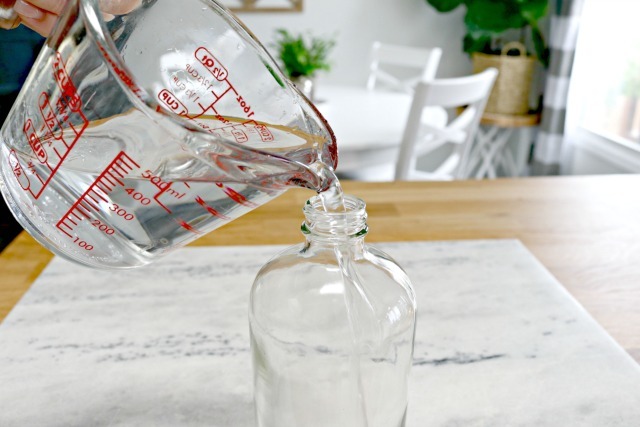 Start by adding 1 /2 cups of distilled water to a clean glass spray bottle. Next, add 2 tablespoons of Castile soap. I like to use Dr. Bronner’s Citrus Orange for this cleaner. Peppermint or Sensitive will work as well. If you don’t have Castile soap, you can substitute with 2 tablespoons of natural dish liquid. Now add 20 drops of lemon essential oil. 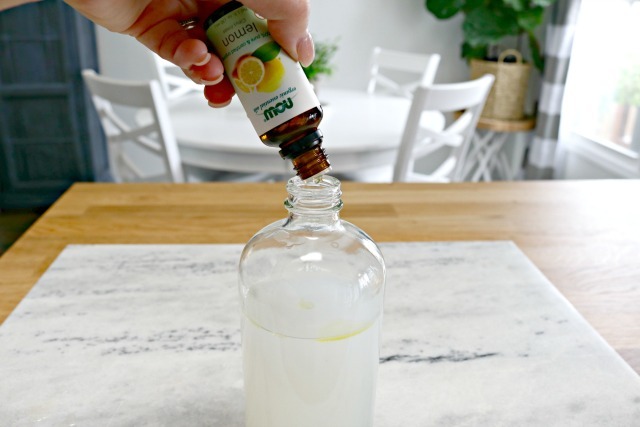 I love lemon essential oil for this cleaner because of its antibacterial and antifungal properties. You could use peppermint, lavender or orange essential oils instead if you have them. Replace the lid and shake well before each use. 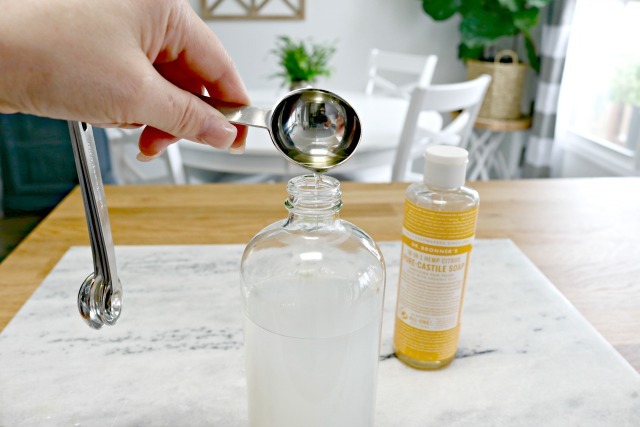 Because there are no chemical binders in this homemade cleaner, the essential oils may rise to the top in between uses. A quick shake will mix it right back in! Spray your countertops, appliances and kitchen table liberally. 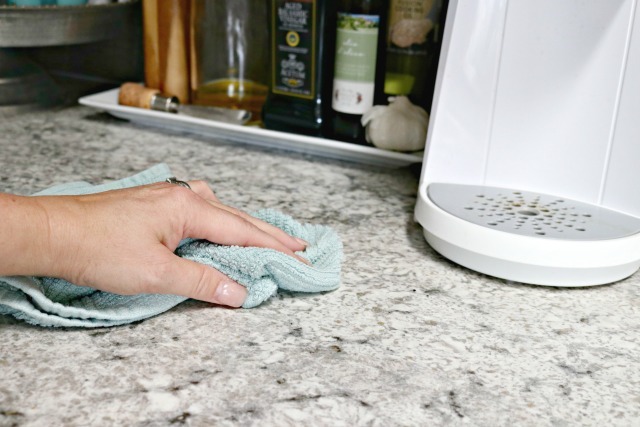 Use a clean cloth or paper towel to wipe away any dirt, germs or sticky spots with ease! 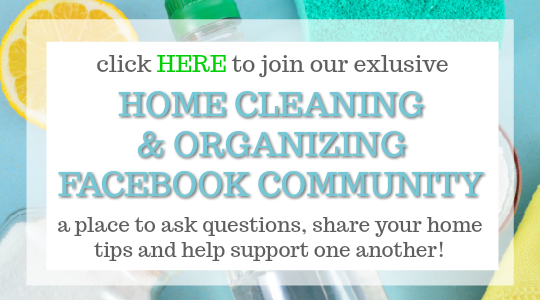 I use this cleaning spray in my kitchen and bathrooms for most general cleaning. It works great on toilets too! Cannot wait to make this solution! Wondering if I might double the ingredients. What do you think? Thanks for all your amazing ideas. Absolutely, Janet. As long as you have a bigger bottle, it should work just fine. You are going to love it! Do you have to use a glass spray bottle, can you use a plastic bottle? Hi, Betty! You can use plastic spray bottles. Some people say that essential oils can eat at the plastic bottles, but I used them for years with no issues. Hope this helps! Is this cleaner appropriate for cultured marble and granite counter tops? Recipe says 1/2 cups water but it looks like more. Is that right? Could you please review this recipe for us? Thank you much for pointing that out, Tess! It was supposed to say 1 1/2 cups. All fixed now! Please tell me, what is natural dish liquid? Is Dawn dish soap usable? Thanks. Natural dish liquid would be a more plant based dish liquid. You can use Dawn for sure! Just want to say “Thank You” for sharing your ideas, they are very helpful to a lot of people!! Can you use it on tile floors too? Can you use it on tile floors as well? Wow, It should be really effective. I always struggle with the oily corners of the cupboards. So, should this be effective on the sticky oily dirt? And also hopefully can help to clean the oven too? You can mix lavender Castile soap and some essential oils. For instance, I love lavender with lemon essential oil. It’s all about your preference for smell. Hope this helps!